Dorm Co. Tip: Microban is all about keeping bacteria out! They say an apple a day keeps the doctor away, but what about a pill a day? Keep the doctor and the germs away with our Microban 2 in 1 Pill Case. Living in college dorm rooms means living in very tight quarters. With so many college students crammed into one building, there are bound to be gross germs everywhere. Keep you and your pills germ free with our dorm pill case that uses cutting edge Microban technology. 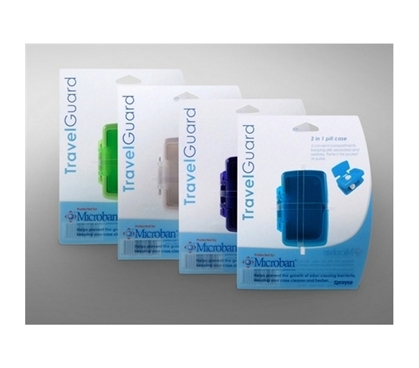 Microban technology is made to actively protect your important pills from nasty bacteria. With two convenient compartments, our dorm case will also help you keep your pills organized. Keeping your pills with you in college is so important. Put our dorm pill case in your dorm shower caddy or tote so you can easily remember to take your pills every night or every morning. With our dorm case in your college survival kit, you'll stay healthy and organized. There's nothing we can do about how crowded college dorm buildings are, but with our pill case we can make it easier for you to keep gross germs away!